Kennis Caravans & Motorhomes offers a wide variety of new caravans for sale from off road caravans, small compact caravans, dirt road caravans, and 4x4 caravans, to large luxurious caravans. Whether you’re a family camper or an outdoor adventurer, we have the perfect caravan for your needs. We welcome you to visit our showroom in Roodepoort, Gauteng to browse our selection of new caravans and find what you’re looking for. Our helpful staff will guide you through all the options and answer your questions so that you can really get a feel for your favourite. We pride ourselves on the best range of on road and off road caravans from leading brands, offering you the best in convenience and style. 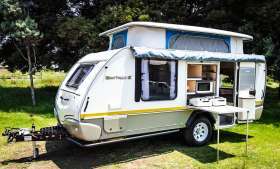 Kennis Caravans & Motorhomes is an authorised caravan dealer in Roodepoort, Gauteng for Jurgens caravans, Gypsey caravans, Sprite caravans, Sprite Tourer dirt road caravans and Jurgens Safari 4x4 off road caravans.